Synovitis occurs when the synovium, which lines and lubricates the knee joint, becomes inflamed. The condition can be caused by rheumatoid arthritis or injury/trauma, but sometimes the cause is unknown. The inflammation is caused by fluid collection in response to the injury, which is one of the body’s protection mechanisms. There are synovial membranes in the hip, knee, wrist, shoulder and ankle joints, and synovitis can occur in any of them, but the knee is most commonly affected. Diseases like arthritis can lead to chronic synovitis, which keeps coming back. Injuries cause acute synovitis, which usually passes if the joint is allowed to rest. If acute synovitis is ignored, however, it can become chronic. The synovium is a thin, filmy material which forms a sac enclosing a freely movable joint in the body. In a healthy joint, it is barely more than one cell thick. It works with cartilage to reduce friction in the knee. There are two types of cells in the synovium. One produces fluid to lubricate the joint, and the other keeps the joint clean by ingesting unwanted materials. When the synovium becomes inflamed, it produces excess fluid, causing the joint to swell. 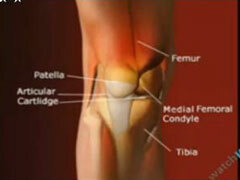 When injury related (acute), this condition is sometimes called "water on the knee." If acute synovitis is recognized quickly, rest is usually enough to calm the inflammation. But if left alone, acute synovitis can become chronic. It can also cause adhesions to form on the joint. Toxic, or transient synovitis causes hip pain and limping in children. Its cause is unknown, though it often follows viral infections like chickenpox. It usually disappears as mysteriously as it came and leaves no lasting problems. Pigmented Villonodular Synovitis (PVNS), which usually occurs in the knee but can be found in other joints as well, is marked by a rust-colored, iron pigment called hemosiderin. PVNS is often missed or misdiagnosed in its early stages, and treatment usually requires surgery.